I happen upon a stylish little cafe about a 5 min drive away – with coconut milk on the menu – sit down the long wooden community table and ask for the wifi password. Notorious the server tells me. Isn’t that a Duran, Duran song I ask. He appears taken aback but agrees and we share a laugh. I suddenly know I am in the right place. Feelings of inspiration rising up within me, the words of an old Duran Duran song that I haven’t heard in years magically begin flowing through my mind and appear to be in tune…..
My inner inspiration is what ultimately drives me to share. It comes from all things, people and places. It can be as simple as a wifi password even. I’ve been sitting with an inspirational story for a few days now. In this case my partner carried it home with him from Thailand, one of the beautiful gifts he returned home with that didn’t have him digging into his post vacation pocket and shelling out more for extra luggage weight. It’s the story of a Buddhist Monk turned artist and how that all came about. The inspiration for me however was not necessarily found in the Monk turned artist story but more about what that story appears to bring to our awareness. Therein lies the inspiration. Let me explain. The disciplined lifestyle of the Buddhist Monk is meant to be a channel for mindfulness and wisdom. Practising is necessary and observing oneself through the practice is what leads to cultivating an even deeper practice still. One of the activities the Monks employ to practice this mindfulness is sweeping the floor and observing the things that come up within them as they do this. This particular Monk expanded upon this practice of mindfulness through observation and kept thousands upon thousands sheets of paper that he would use to paint circles. 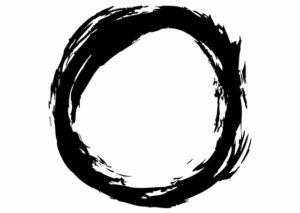 Through the practice of painting circles the Monk was able to observe when his mind was taken away – when he was no longer present in the activity and when that happened – when his mind was ‘out there’ , it showed up in how the circle was presented on paper. At times when he was present the circle would be near if not perfect and at times when his mind shifted to outside himself the circle’s outer ridges would reflect that with an irregularity or irregularities. Each circle as unique as a snowflake based on the mindfulness of the Monk in any given moment. The Monk eventually left the Monastery at the urging of his elders so that he could pursue his art full time – and quite successfully at that. One would think the inspiration may lie in the message of staying present and mindful – to strive for that perfect circle – in this case the circle representing life and yet for me the inspiration was not that. The inspiration was that each circle is a uniquely complex work of art worthy of being revealed. That each irregularity on the outer edges simply part of it’s story (where the Monk’s presence went when he went outside of himself). These irregularities only seek to make the circle more interesting. My partner did bring back 2 of the Monks painted circles with him from Thailand, one more ‘perfect’ than the other and when he asked me which we should display on the wall behind the desk in our office there wasn’t the slightest hesitation. I loved that I could see exactly where the Monk had gone outside of himself, I loved that the circle had a story.